My annual pilgrimage this year to the Views from the Avant-Garde (the experimental film sidebar at the New York Film Festival) was coloured by viewing experiences in the two days prior to the festival. One was a new film projector performance by Bruce McClure, Evertwo Circumflicksrent…Page 298, which was part of the Walking Picture Palace screenings curated by Views co-programmer Mark McElhatten (Gavin Smith is the other Views programmer). This new work by the ever inventive, and of late ever amazing, McClure uses two modified projectors to create an orb of light in the middle of the screen, surrounded by a field of black. The light is twitching and pulsing with a barely contained energy that wants to explode out of its confines. McClure has created something that feels as large as a supernova at the brink of destruction and as microscopic as an atom ready to split. Evertwo is raw, powerful, primal, and strangely frightening. Perhaps it was this lack of interest that day in what was familiar that opened me up to works by three artists that I hadn’t previously given much consideration: Arshile Gorky, Wassily Kandinsky and, particularly, Cy Twombly. Their paintings, all abstract, are at first glance messy, disorganised, random. But this gives way to seeing the order in disorder, the wonderful use of colour and form. There is harmony in the “mess” and a vitality and, as with McClure, energy. As I head to Views the next day McClure and Twombly are on my mind and I’m hoping to be dazzled by a command of form, to be surprised by unexpected choices that somehow work, to see things new and great. I had little patience for the familiar, no matter whether it was good or not. Luckily, Views offered up many things to be excited about. North Shore is Fred Worden’s first entirely abstract digital video and it is a continuation of his exploration of the qualities of the medium. Visually it is something of a return to his last two 16mm films, The Or Cloud (2001) and If Only (2003), but the feel of the video is decidedly digital and not filmic. Worden is foregrounding the look of digital – the imagery is smooth, it has something of a metallic sheen to it or the glistening quality of a soap bubble. The texture is quite different than the films. It is the editing and rhythm of the work, though, that stands out. Worden punctures a black background with staccato bursts of white markings and colourful morphing shapes that pulse, and flicker, and ooze in a way that feels quite organic and uncalculated, in sharp contrast to their “artificial” look. In the brilliant Black and White Trypps Number Three Ben Russell has captured something very primal about the nature of spectatorship. He films an audience at a show featuring the hyper, experimental noise band Lightning Bolt and the equally experimental drone of musician Joseph Grimm. The audience members are seen in an improvised iris, focusing attention on individual faces rather than on the crowd as a whole. The young concertgoers initially respond to the music with a kinetic abandon that borders on the humorous. As Lightning Bolt gives way to Grimm, though, everything slows down and becomes quite dark in mood. The energy has been spent and everyone seems lost, given over to the moment. They are no longer distanced viewers of the spectacle before them but are now integrated parts of the experience. Forget experimental, Trypps Number Three is anthropological filmmaking at its finest – it is a rock and roll Les Maîtres fous. Surely one of the loveliest films at Views, Jeanne Liottta’s Observando el Cielo calls to mind Joseph Cornell much the way Ben Russell’s film does Jean Rouch. But I think Cornell the collagist rather than Cornell the filmmaker. There is much wonder and beauty in Liotta’s time-lapse photography of the night sky, a sense of awe that seems right at home in Cornell’s boxes. 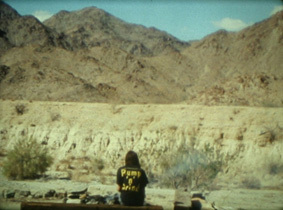 Ben Rivers seemed to be the man of the hour at Views, with five films spread out among three of the group shows. Three of the five seem to owe inspiration to early 1930s horror films, James Whale and Michael Curtiz perhaps more than Tod Browning. In Old Dark House (the title’s a give-away!) and House Rivers explores several abandoned “homes”. In the first, everything is lit by flashlights, allowing only fragmentary glimpses of the buildings Rivers is filming in and leaving most of the structures’ interiors to our imagination. House, too, emphasises dark corners, but this is also a playful ghost film, with floating candles and sheets. The space here is an idealised one – Rivers constructed a model house to film, again adding to the playful nature of this work. What we don’t see in these films is as important as what we do. Such is the case with We the People as well. Deserted village streets, the kind one might expect to see in Whale’s Frankenstein, are accompanied by sounds of crowd noise and running feet. Hinted at and unseen presences give these empty spaces their charge – they are ready, just waiting for the drama to unfold. In Memoriam is a trilogy of animated digital videos by Phil Solomon that are made entirely from footage derived from the video game series Grand Theft Auto. They are dark and disturbing works, each more so than the last. Untitled (for David Gatten), which was co-made with Mark LaPore shortly before his untimely death, features a lone, young African-American man. He is confronted by a mark of beauty – a rotating bouquet of flowers floating in front of him. He runs, but again is stopped and transfixed by this mysterious object. He seems confused, unsure what to make of it. There is a sense of an approaching epiphany, but it never comes. Rehearsals for Retirement feels almost mythic. It is a journey film to an underworld and limns the thin line between life and death that is more at home in Gilgamesh or The Odyssey than in the modern world. A hearse appears in a tunnel of light. Fire erupts. Travelling shots by air and land suggest movement toward something and a simultaneous decent. It may not be what we want, but there is a destination. Grays and blacks dominate in Last Days in a Lonely Place, the most nihilistic of the three works. The possibility of a reckoning with beauty in this life and the promise of some kind of afterlife, even if it be a Hades rather than a Heaven, are both gone here. Last Days is empty and sombre. A lone figure inhabits a barren city, wandering with no purpose. Sound excerpts discuss the end of the world and the insignificance of man. This final work of the trilogy is an affecting and troubling disquisition on futility. Ken Jacobs’ magnificent Capitalism: Child Labor demonstrates that formal brilliance and political content can happily coexist. And not just coexist – the political message in Jacobs’ short digital video is constructed in a profound way by his manipulation of the image. As with his other digital works in the festival, Jacobs uses the right and left images of a turn-of-the-century stereoscopic photograph, alternating them to create a flickering picture of apparent movement and depth. 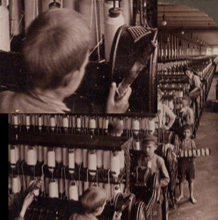 Here his source photo is of a factory scene, with endless rows of what seem to be textile machinery and workers ranging from grown men to small children. The movement Jacobs creates is not real – it is illusory and ironically emphasises the stasis in the image, hinting at a kind of entrapment for those we see. The children forced to work in this industrialised box can only expect to grow up where they are, one day becoming the men in the scene. Jacobs also overlays close-up views of sections of the photograph, highlighting telling details. The bare feet of one young boy speaks to the continued poverty of the child, despite his “status” in the work force. Most disturbing, though, is a close-up of a boy’s face as he stares directly into the camera. It is a look of loss and confusion and those few seconds are worth more than the countless hours of visually sterile political documentaries combined. Michael Robinson is easily one of the most impressive young filmmakers working today and a recent, loose quartet of films are among the most exciting experimental works of the last several years. Victory over the Sun is the newest of this group and is his richest and most stunning work yet. The film opens with shots of desolate World’s Fair sites, once places of hope and promise now abandoned. Later Robinson includes visuals from an early video game system and from a self-hypnosis tape and sound from the 1987 film Masters of the Universe and an orchestral version of the Guns N’ Roses song November Rain. Robinson combines these disparate elements with many of the themes circulating in his other works – the way landscape can be used to define mood, a sophisticated use of sound to add complexity to the meaning of his visuals, a careful inclusion of pop-culture fragments not as easy post-modernist gimmicks but as barely familiar markers of our shared lives – into a quasi-science fiction cautionary tale about the world around us and our tenuous place within it. Victory is a foreboding warning, but Robinson ultimately leaves room for a sense of hope. Laida Lertxundi’s Footnotes to a House of Love is the type of thing you hope for at a festival: something remarkable by someone you’ve never heard of. Not much happens in the film – much to its credit. A young couple inhabits a dilapidated house in the California desert. They read, play the cello, piss, but mostly just walk about. Their actions, however, are entirely peripheral to the film. Footnotes is most centrally about the presence of place, the house and the desert beyond, and the possibilities they seem to invite. Narratives and relationships are only just hinted at and seemingly swallowed up by the surroundings. There is a subtle mysteriousness to the place that could easily have made it a site for terror, or at least danger, but this is constantly leavened by a gentle, disarming playfulness and teasing. It is not surprising that what were likely the best works at Views were “retrospective” screenings of newly preserved films by two of cinema’s great masters: Robert Breer and Gregory Markopoulos. The rapidity of the editing and use of single framing make these films crucial primers for attentive viewing. Anthology Film Archives’ 35mm blowups of Breer’s Recreation (1956) and the original version and a contemporary alternate version of Eyewash (1959) looked spectacular. Breer combines animation and photographed shots in a dizzyingly fast montage that juxtaposes both similar and radically different graphic elements, exploring the collision and synthesis of the shots and testing the limits of perception. These early works by Breer remain vital and engaging – they are minutes-long kaleidoscopes of energy and form. Gregory Markopoulos’ Eniaios IV “Nefeli Photos” reel 2 (2004) is the re-working of the footage from his 1967 film Bliss for inclusion in his projected 80 hour Eniaios cycle, which is gradually seeing completion after Markopoulos’ death thanks to the dedication of his partner, filmmaker Robert Beavers. Nefeli extends the original six minutes of Bliss, which was shot in a Greek church, into thirty minutes of magic. Markopoulos inserts black to break up the photographed shots (most of the running time is black screen) allowing the viewer to absorb and briefly consider each of the shots. And the shots are definitely worth this attention. Markopoulos used single framing and short bursts of filming for Bliss and also masked the lens to expose only part of the frame. He then rewound the film and shot again, using different patterns for filming and masking. Each frame, then, is a tiny, jewel-like piece of a puzzle, or a tile in a mosaic. The new structure used for this footage in Nefeli allows for a closer, more intimate viewing of the artistry of the church itself and of Markopoulos’ filmmaking. In the digital short The Rabbit Hunters Pedro Costa revisits characters from his stupendous Colossal Youth and shows that the epic accretion of details and story lines in his three hour opus can be pared back to a comparatively slight 23 minutes with satisfying results. The Rabbit Hunters is something of a coda to his feature, and one benefits from having seen Youth, but it successfully stands on its own as well. Made as part of the Jeonju International Film Festival’s Digital Project, Rabbit continues the exquisite sense of place found in Youth and Costa’s sensitive and meaningful filming of the city, whose character articulates as much about the peoples’ lives as they do. Costa also uses colour masterfully to add another layer of visual complexity. Browns and oranges dominate and this rust-coloured palette mirrors the stagnation and slow deterioration of the characters’ lives. Patrick Friel is the Director and Programmer of the Onion City Experimental Film and Video Festival (organised by Chicago Filmmakers), founder and programmer of the independent screening series White Light Cinema, and former Program Director (1996-2007) for Chicago Filmmakers. He has published in Film Comment, Cineaste and Time Out Chicago and is the current Managing Editor for the volunteer-run Chicago online film resource Cine-File.